Roulette is such a casino game which has different version. American Roulette is one of them. Numbers of pockets make American Roulette different from other version of Roulette such as European Roulette. 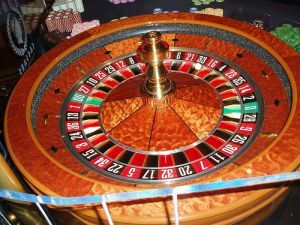 The difference of American Roulette with European Roulette is that its wheel contain two zero slot while European Roulette has one zero slot. But the basics of the game remain same in both. As like European Roulette American Roulettes wheel have pockets numbered 1 to 36. The total pocket of American roulette is 38 one the other hand the total pocket of European roulette is 37. You don't have to worry about the betting odds because it remains same for all version of roulette. As for example if you play make a bet on a single number then the payout will be 35 to 1. Actually, the birth place of roulette is Europe but in early 1800's it traveled to America. Then it became very popular and an extra zero was added to the wheel by the casino managers. The goal of adding extra zero was increasing the advantage. The house edge of American roulette is pretty high than other roulette77 variation and it's approximately near 5.26 where as in European roulette house edge is nearly 2.7. American roulette has two zero slot with 36 numbers that's why the probability of coming numbers is increased and its 1/38. In American roulette wheel there is two none zero slot which are place in opposite direction. The slots are numbered as Zero and double zero indicating those with green color and the other numbers are indicating with red and black. Bodog roulette site allows US citizens offer them to play roulette for cash or fun. Bodog offers both American and European roulette. You have to choose your favorite one and expertise one. You can also practicing on this site because this website offers it with no downloads.